Split hem at the side so you can tie it or wear it long. 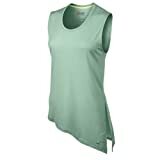 Sleeveless design for enhanced range of movement. The Nike Dri-Fit Touch Club Side-Tie top features a loose fit and an asymmetrical hem for comfort and versatile layering. Split hem at the side so you can tie it or wear it long. Sleeveless design for enhanced range of movement. Scoop neck for unrestricted comfort.